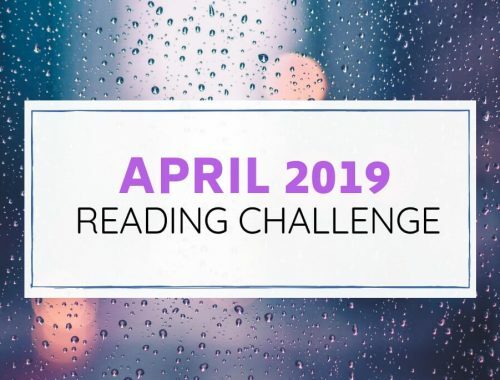 Looking for the ultimate Reading Challenge for 2019? Join us for our 2019 reading challenge and read a book a week with the Pingel Sisters! A few years ago, our mom showed me a reading challenge for adults she’d found on Pinterest. “You can do it with me,” she remarked. “Why not?” I told myself. 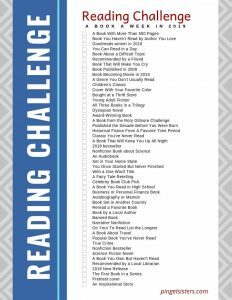 While I don’t think I actually finished that reading challenge, I found that it helped me focus my reading. Instead of reading more of the same books, I suddenly was choosing books that had been lingering on my to-read list for far too long. I never would have imagined that a few years later I would have a book blog of my own. I was just the other day noticing that on Goodreads, I have a number of books that I have been meaning to read now for 5 years. Now seems like the perfect time for my own Pingel Sisters Reading Challenge 2019. Ever ambitious, we wanted our reading challenge to be a bit of a challenge. We wanted a goal that could be realistically in reach for many people, while still taking a concerted effort. That’s why we settled on a book a week. If you’re not quite ready to read a book a week for your 2019 reading challenge, we’ve still got you covered! In 2019, we are also launching our Pingel Sisters Book Club. We picked 12 of our favorite categories from this reading challenge, and we will be reading one book each month. We are still working up all the details, but we would love for you to join us! Following along on social media? Use the hashtag #readingchallengeaccepted! Want help finishing the challenge? Feel free to read along with us. Weekly Newsletter – Be sure you don’t miss a thing. Sign up for our weekly newsletter below. We’ll keep you up-to-date on the reading challenge, the book club, our blog posts and provide exclusive content just for you. Sign up below. Wooo, I like this challenge! It’s ambitious, so I will try to fit some of my books into these categories. That’s usually how I do it. I look at my to-read list and see what books fit which categories. But since I made the challenge, it coordinates with my TBR list quite well. Great challenge it looks fun. Thanks. We are hoping everyone enjoys it. Best of luck with this challenge. I love this idea! I’m in! Yay! We are excited to have you! I included it on my list of Reading Challenges. Great challenge. I’ve tried the 52 book challenge a couple of times and couldn’t get myself organised. I’m very interested in you monthly book club though. It sounds like one I can actually do. We’d love to have you in our book club. We are working on all the details right now, and will hopefully have all the details by next week! I love the idea, although I definitely won’t have the time? A book a week is definitely not for everyone. You should consider joining our monthly book club instead. Good luck. Not sure I could do it. I hope you can do it! I usually get frustrated with myself after a while. Haha. The last one I did, I never finished, but I still had fun trying. I guess I’m required to finish this one. I love this. Such great prompts. I’m doing it! I’m in. This is a great list of prompts. I did this before just challenging myself. The most I have ever read was 60 books in one year in 2012. Let’s do it!!! Yes, you should join! I think you would have so much fun doing it with us. Reading knows no age limits! OMG, lol. I am impressed and incredibly daunted at the same time. Even though I usually read about 50 books a year, seeing all the different topics written out makes me realize how much reading it is! Which is AWESOME. I love the idea of expanding into new genres, too. Some really great ideas on there. My fave is “prettiest cover” because I love me a pretty cover. We decided to add it to our list of Reading Challenges! I’m in! I’ve been getting ready to do a blog post about book challenges I’m going to try for 2019 and I would so much rather do one with a fellow book blogger than with popsugar. Ha! Now to pull out my TBR list and see where I can fit things to whittle that crazy thing down. I’m doing the same thing with my TBR list! You might consider including variants of fanfictions, online serial novels, graphic artwork, and books of a completely opposite genre into your list. There’s a ton of good ones out there. I believe that everyone might benefit from not being stuck in a rut. Of course, the current list does accomplish certain levels of that. But cultural direction can be obtained if more thought were put into it. We never consider ourselves influential enough. If only we knew how many bits of information we could manipulate. Not a bad idea. I’ll have to keep it in mind if I do this again next year! It’s already 2019 so better choose a book for THIS week.Think I mentioned going to try to use as many of my own stash so really looking forward to seeing what I have. Happy New Year if I already haven’t said! Just a thought..do we post our completed reading here? I’m down to try this. I fell far short of this number in 2018, but I managed to read three novels in the past week, so now I’m all pumped up. (oh, if only every week were spent at the cottage with no responsibilities!) Quick question: can you drop a link to the Rory Gilmore challenge? I can’t wait for that one. I once downloaded a list of 338 movies referenced in the Gilmore Girls but this sounds even better! I’d like to do this…but working 7 days a week doesn’t leave a whole lot of reading time!! I’m gonna try as many as I can! But a book a week? If I’m lucky, I scrounge enough time to do a book a month! Feel free to join our book club instead! You don’t have to read along every month, just the ones where you have some time. I’m going to attempt an internet reading challenge. Probably this one. Instead of the full challenge, I cut it down to 12 book prompts, to average out to a book per month. I tried to pick prompts that I know I will read but also push me outside of my reading comfort zone a bit. That’s great! I love to see people taking the challenge and adapting it to their own lives! We just started putting some work into Goodreads, so we will see what we can do. I love this book challenge. It got me thinking though. What if a book fits into multiple categories? Can you check off all that apply? You can do it however you want to! If you’re a purist, then you do 52 books. 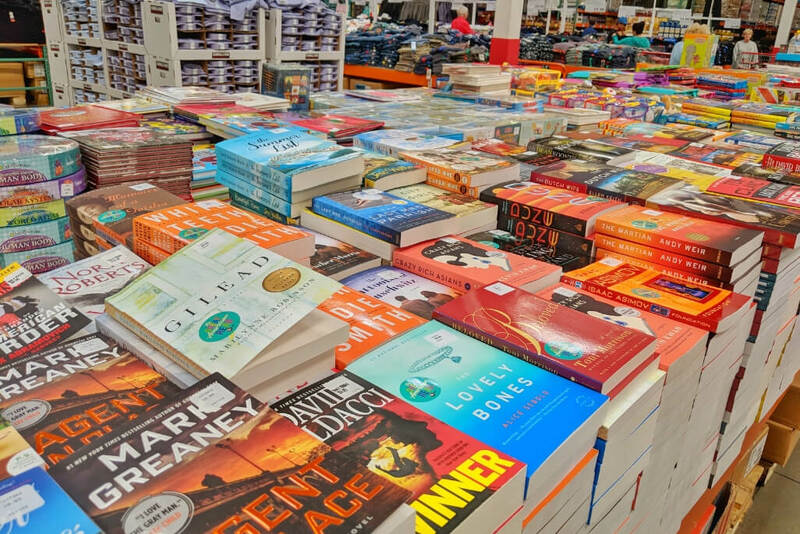 If not, you count books across multiple categories. I talked my sister,my daughter-in-law, and a friend in to doing this Challenge. We are having a lot of fun following your recommendations, making the books we are reading fit somewhere and staying even with the calendar! We may not be reading in order but y’all are encouraging us to read lots of different books!